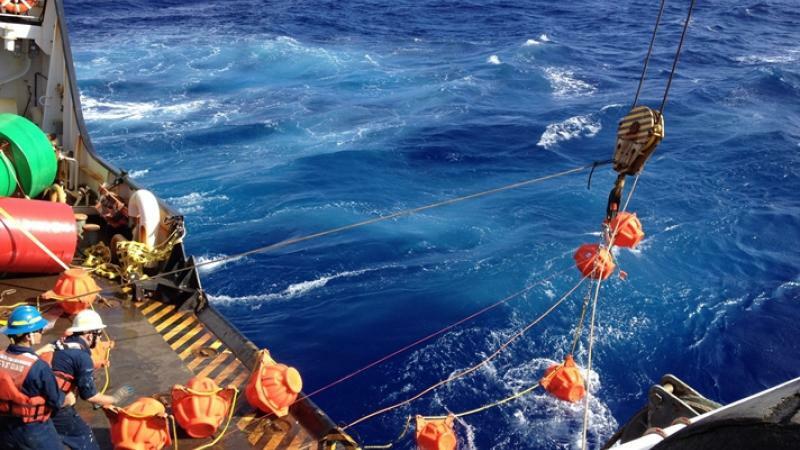 Ever wonder what the deepest, darkest depths of the ocean sound like? In the Challenger Deep trough in the Mariana trench, scientists made a series of haunting recordings 36,000 feet beneath the ocean surface. You'd think it would be completely silent down there—but you'd be wrong. Encased in titanium, scientists sent down a hydrophone for 23 days straight to record ambient noise, returning some surprising results. "The ambient sound field is dominated by the sound of earthquakes, both near and far, as well as distinct moans of baleen whales, and the clamor of a category 4 typhoon that just happened to pass overhead," said Robert Dziak of the National Oceanic and Atmospheric Administration (NOAA). Dziak added that sound waves travel for long distances in the Earth's oceans, so making the recordings wasn't that difficult. What was difficult, however, was building something that could withstand the 16,000 pounds-per-square-inch of pressure 7 miles below the ocean's surface. Several of the recordings were posted on the Internet, from spooky whale calls to the rumbling of the Earth. You can listen to them for yourself below. The audio recordings of the earthquakes are particularly eerie, as they're pretty much what they sound like here on the surface. Scientists are hoping to return to Challenger Deep in 2017 but this time for a longer period and using a deep-ocean camera.